Now-a-days, most people love to make videos via their smartphones. As majority of smartphones come with an ability to record videos in 1080p. However, sometimes when you make any video then you need to edit some content of video and for that only a best video editor app can help you to give a delightful touch to your video. 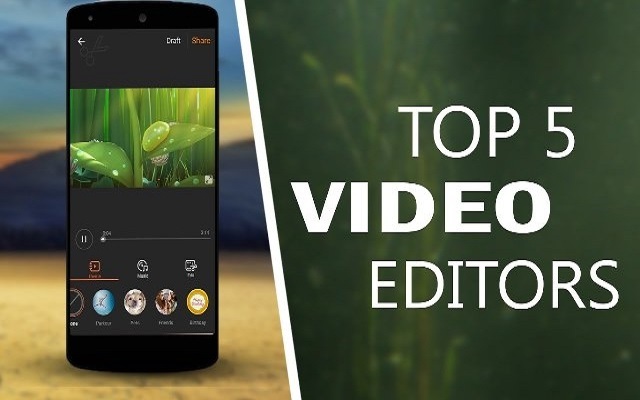 There are vast number of editor apps for Android smartphones available in the Google Play Store but we have compiled a list of free best Android video editor apps which are available in the Play Store. These apps have a collection of amazing features and are convenient to work with. With the help of these best android video editors, you can arrange the clips. Moreover, you can also upload these videos to Facebook, Instagram, Twitter, or YouTube. Video editing apps are so amazing and convenient. We all know that the Google Play Store is packed with vast number of them. So we have picked out 5 Best Video Editors for Android in 2018. They are absolutely free and you can download them with ZERO cost from Playstore. If you are interested to download video editing apps for android free and want to know the details then go through the post to discover the apps. FilmoraGo is outstanding best video editor for android which is preffered by many users. You can perform many functions like trimming, cutting, adding themes, music, etc. with this app. With the help of FilmoraGo, you can make square 1:1 videos for Instagram, 16:9 videos for Youtube. Moreover you can create reverse videos, add transitions, slow motion, text, etc. to make your video more beautiful. You can create reverse video that looks like a magic trick. You can create Multiple Fast or Slow Motions in the Same Video! Elements: impressive Still and Motion Graphics. You can save the videos in your gallery directly. Other than that you can also share it to any social networking site directly from FilmoraGo Android video editor app. You can edit videos on your android mobile device with Adobe Premiere Clip. It enables you to edit any video so quickly. It is fast and you will enjoy when you use it. The most interesting feature of this Android Video Editor App is the automatic video creation capability. Adobe Premiere Clip can automatically create videos with any photos or clips that you choose. 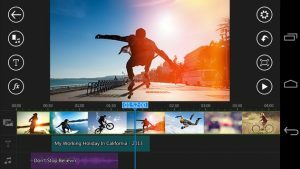 You can also create videos with its multiple video editing functions like cutting, trimming, adding transitions, music, filters, effects, etc. You can download it free. This best video editor for android does not display any ads. You can share video directly from this app. This app really simplifies the editing process. In many countries, VideoShow is ranked as the No.1 video editor & video maker app. It has received numerous awards and is considered to be one of the best free video editing apps for Android available in the Play Store. VideoShow comes with such a user-friendly interface. It is easy to use and very reliable. You can make your video more delightful by adding text, effects, music and sound effects or perform live dubbing. This amazing app carries 50 different themes. Moreover, you can also reduce the size of your video by compressing it. In VideoShow Android Video Editor App, videos do not lose their quality and have no video duration limits. This app has support for almost all Android devices. In the app markets, this amazing app has received numerous honors and has gained more than 2,000,000 five-star ratings. It is the choice of 200 million users and was also included in the list of Best Video Editors. PowerDirector is also one of the best video editors for android. This app is a full featured video editing tool. You can use this app to create your own videos with all kinds of files: photos, video clips, and audio tracks. The beautiful collages making take time but you will get best results. PowerDirector is the best video editor app. It comes with powerful timeline video editing, free video effects, a photo video editor and slow motion. Moreover, you can use voice over & action movie effects to produce & share great videos on YouTube or Vine. Now you can produce 4K movies with PowerDirector video editor for android. You can also edit GoPro or phone footage just like iMovie, Magisto or Final Cut. Ciberlink PowerDirector no doubt, gives you best results. Other apps offer more effects and are easier to use, but the results you get are not so amazing like what you get with this app. KineMaster is a best video editor for Android, that comes with well-designed interface. This app has powerful features. You can enjoy a drag-n-drop technique to import different media files easily. KineMaster offers you unprecedented levels of control over the editing process to create professional videos quickly. There are different types of transition in between video fragments, or insert blocks of texts or subtitles. It is a subscription service, but you can use it in trial mode without a subscription. It has multiple layers of video, images, effects, overlays, stickers, text, and handwriting You can download more effects, royalty free music, overlays, stickers and more from the KineMaster Asset Store. 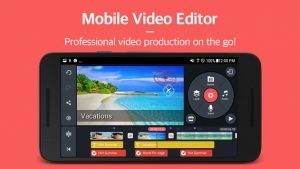 There are vast number of free video editing apps for android, they all offers different features in order to facilitate you to edit your videos. 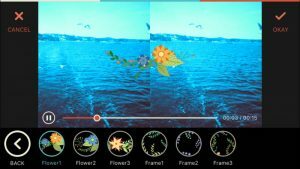 The above mentioned 5 best free video editing apps for android are preferred by million of users across the World and fall in good ranks.